Austin is loaded with regional Mexican restaurants, trendy Mexican restaurants, Mexican fusion restaurants; expensive weekend brunch Mexican restaurants (don&apos;t pretend you don&apos;t know the outfits I&apos;m talking about). But I&apos;m inviting you to climb into the way-back machine. We&apos;re going back 50 years or more, back to a time before Tex-Mex was called Tex-Mex. Back then, there were five Austin Mexican food restaurants of note: El Rancho, El Matamoros, El Toro, El Gallo, and El Patio. If you wanted Mexican, you had to go to one El or the other. Of those, three survive: Matt&apos;s El Rancho, El Gallo, and El Patio. There is a reason they have lasted in this city where restaurants open and close con frequencia: they deliver. Their clientele consists mostly of locals. Each has its own appeal, its own history and its own way of doing business. And for anyone interested in an old-school Tex-Mex dining experience, none of them will disappoint. Let&apos;s talk about these joints. Matt&apos;s El Rancho #2 lunch special, with extra queso. Because that&apos;s important. Golden Gloves Champ and professional boxer Matt Martinez began doing business in Austin in 1952 on what is now Cesar Chavez Street (the Four Seasons hotel is there now). Now located at 2613 South Lamar, Matt&apos;s El Rancho continues to host eager crowds of Tex-Mex aficionados. For decades, Matt was a fixture at El Rancho, greeting guests at the door every afternoon and evening. He, and his wife Jamie, have since passed, but the restaurant remains family-owned and operated. This is the place Longhorn fans gather before the night games and after the day games. It drips of tradition, as well as (the highly recommended) Bob Armstrong dip with chips. 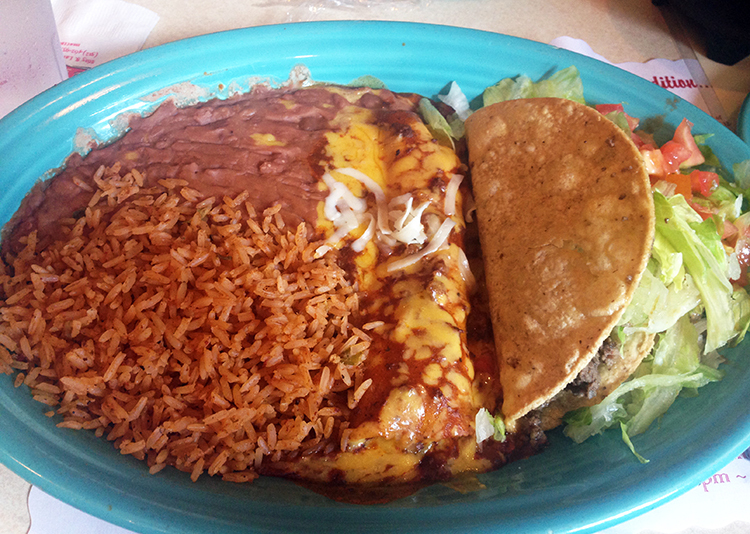 It is a rule of thumb that Tex-Mex restaurants can be judged by the ubiquitous #1 dinner. That&apos;s an excellent choice here, but a happy menu surprise is the frog leg entree, fried or grilled. If you&apos;re on the fence, I recommend the grilled. El Patio, just north of the Drag (2938 Guadalupe), has been around since 1954. It remains a Tex-Mex favorite of UT students and locals. Ask an old El Patio patron about it, and he/she will invariably mention the practice of serving saltine crackers, rather than tortilla chips, with salsa before the meal. That has changed (unfortunately, IMO). Now you get the conventional tostadas, but I&apos;m told the crackers are still available for the cognoscenti; you just have to ask. Don&apos;t go on Sunday. You&apos;ll find El Patio closed. Did I mention the #1 dinner? Here you will find it includes guacamole. Most places youll need to upgrade to deluxe in order to enjoy your smashed avocado salad. Finally, there&apos;s El Gallo. When it opened in 1957, it was considered on the fringe of South Austin, at 2910 South Congress. Austin has grown; El Gallo is well north of Ben White Blvd., a five-minute drive from downtown. Oddly, El Gallo does not offer a #1 dinner. Here it is called the El Gallo Dinner, and it&apos;s one of my favorites. There are a few things to know about this family-friendly restaurant. It is open for breakfast starting at 8 am. It is closed on Mondays. There are mariachis on Friday evenings. And when you are hungry for goat (or just feeling adventurous) you&apos;ll find cabrito al horno on the menu. First-hand knowledge of any of these three establishments will totally nail your Tex-Mex cred with any Austin ex-pat anywhere on the planet.